1. Set the oven at 350 degrees. Butter a 9-by-13-inch baking pan. Dust it with flour, tapping out the excess. 2. In a bowl, toss the blueberries with 1 tablespoon of the flour. 3. In another bowl, whisk the remaining flour, baking powder, and salt. 4. In a third bowl, whisk the egg whites until stiff. 5. In an electric mixer, cream the butter and sugar. Beat in the yolks, one at a time. 6. With the mixer set on its lowest speed, beat the flour mixture into the batter alternately with the milk, beginning and ending with flour. 7. Remove the bowl from the mixer stand. Fold in the whites, then fold in the blueberries. 8. Bake the cake for 40 to 45 minutes or until it pulls away from the sides of the pan and the top springs back when pressed with a fingertip. 1. In a bowl, sift the confectioners’ sugar. Stir in the lemon juice and rind. Add enough additional lemon juice to make a mixture that pours easily. 2. Drizzle the glaze over the cake. 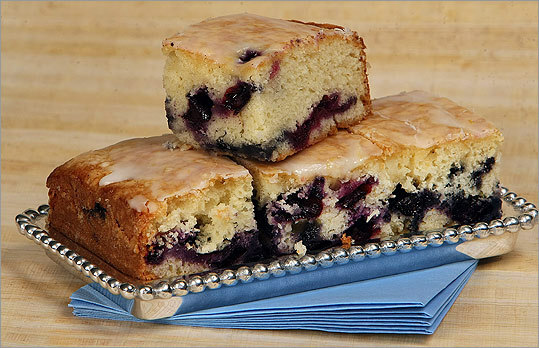 Check out photos and recipes for all the blueberry cakes we taste-tested.